Andhra Pradesh CM and Telugu Desam Party (TDP) chief N Chandrababu Naidu has written to the EC claiming that nearly 30 per cent of the EVMs were not working properly till 10 am. A lot of names were missing from the voter's list and several clashes were reported from Andhra Pradesh and Telangana in the first phase of Lok Sabha elections on Thursday, April 11. Missing from the list was Shobana Kamineni, the vice-chairperson of Apollo Hospitals. Shobana had returned back to India a day ago to cast her vote. But she was left shocked as her name was missing from the voter's list when she went to exercise her vote in Masab Tank polling booth in Hyderabad. "This is the worst day for me as an Indian citizen...I came back because I wanted to exercise my franchise. I came to the booth and I was told that my vote is deleted," Shobana said, reports NDTV. "Am I not counted in this country? Is my vote not important? This is a crime against me as a citizen and I will not tolerate it," she added. Shobana is the daughter of Prathap C Reddy, the chairman of Apollo Hospitals. She said that she had voted at the same booth in December 2018 for the Telangana state election. According to reports, two party workers of TDP and YRS Congress Party (YSRCP) were also killed in a clash that erupted at AP's Anantapur district. The incident took place near polling booth No. 197 at Veerapuram in Tadipatri constituency. Another clash broke out between workers of the two parties in Puthalapattu Constituency in Bandarlapalli, following which the police had to intervene with lathi-charge to control the situation, reports IANS. 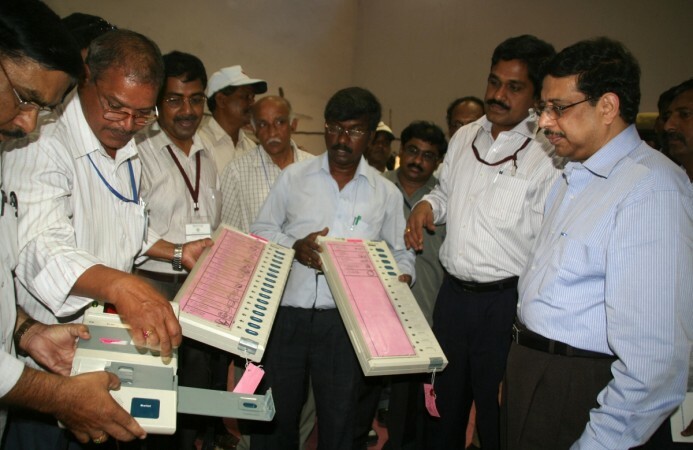 Several complaints of EVM malfunctions and glitches were also reported from Telangana and Andhra Pradesh. According to Andhra's Chief Electoral Officer (CEO) Gopala Krishna Dwivedi, EVM malfunctions were reported from more than 50 places. Andhra Pradesh CM and Telugu Desam Party (TDP) chief N Chandrababu Naidu has slammed the EC over voting machine malfunctions. He has also written to the EC claiming that nearly 30 per cent of the EVMs were not working properly till 10 am.